In this competitive world, the only wish of every business or organization is to provide the potential customers with greater service that satisfies all their requirements and needs. Customer satisfaction is the key element for the success of a business or organization. Providing best customer service requires the following: ( i ) the technique to mange and handle the challenging problems ( ii ) immediate and knowledgeable responses ( iii ) providing the right and accurate solutions. Increase your customer satisfaction by supplying the best customer service. The first and foremost element for enhancing the customer satisfaction is to find out what the customers really want, what is their desire. The next comes the listening skill. It is very important to make known the customers that you are listening to their words. Examine the customer body language from their conversation and act in accordance with them. The other factor which plays an important role is tone. Make use of positive words while communicating with the customers in order to gran their attention. The next thing to consider is greeting the customers. Make your customers to feel comfortable for a smooth communication link. Make a clean and clear conversation with them. Since they monitor the way you communicate well as what you communicate about your business. It is necessary to show the customer how much they are valued. One way to make the customers to feel good about your business or organization is to make them realize that they have been given the primary importance. Try to show them that you are caring for them. Be genuine and customer friendly. Grab the problem of the customer quickly without making them to re-explain themselves and response to the customers with the right solution on time. Also make sure that they have obtained the needed information with complete satisfaction. 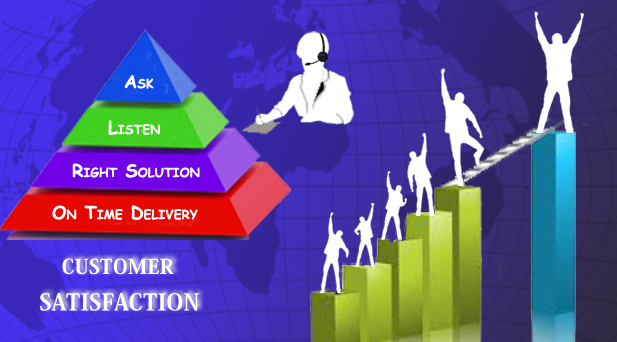 Providing on time solutions is also an important factor to be considered for gaining customer satisfaction. Most of the customers will not encourage long call-waiting time. They may get annoyed if they have been pt up in call waiting for a long time. Avoiding this strategy will greatly help to improve the customer satisfaction. If in case there occurs a situation that you could not provide the customers with the needed solution at that time, just make a note of that number , follow up once you got the required resolution and ensure for the satisfaction of the potential customers. Listen and pay attention to the customer feedback. Use their focus group and keep in touch with them. This may greatly help in the success of your business. The tips that have been listed above may help in boosting up the satisfaction of your valued customers. After all, to have an efficient customer service, analyze and grab what your customers really want and provide them the best, needed information and also ensure that they have been fully satisfied with your service.